Caption: Former Presidents Johnny Hassan, left and John Lewis, with 2015 BVI Athletes of The Year Presented by Sol, Trevia Gumbs, Jr. Female AOY; Janella Thomas for her son Malaki Smith, Youth Male, AOY; Kyron McMaster, Jr. Male AOY and Beyonce DeFreitas, Youth AOY. Photo Credit. Cleave Farrington. DECEMBER 30 Long Jumper Chantel Malone and field events specialist Eldred Henry, 3-peated as the British Virgin Islands Sr. 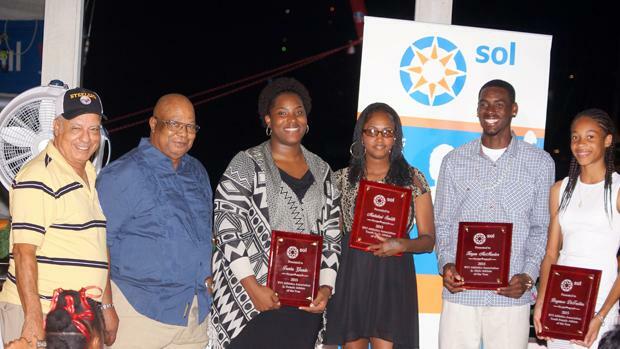 Female and Male Athletes of the Year, when the 2015 awards were presented by Sol on Tuesday evening at The Moorings' Mariner Inn, during the BVI Athletics Association 7th Athletes Awards Gala. After a fifth place finish in the Long Jump at the Pan Am Games in Toronto, Canada in late July, Malone earned a silver medal in her pet event at the 2nd North American, Central American and Caribbean (NACAC) Championships in Costa Rica in early August, after cutting the sand with a personal best leap of 6.69m, to improve her own National Record. Malone, who also qualified for the IAAF World Championships in Beijing, China over the summer, has won the AOY honor for four of the last five years and was the Jr. AOY in 2009 and 2010. She ended the 2015 season ranked #41 in the world. Henry, who repeated as National Jr. Colleges Athletics Association (NJCAA) Discus Throw champion competing for Central Arizona, added the Shot Put title to his portfolio as well, for his third Jr. Colleges All America honor. In the Shot, he had a heave of 20.00m, becoming the first athlete in the OECS to reach that plateau. He finished the season rank #60 on the globe in the event. He also was the Premier Dental Collegiate Athlete of the Year award. Central Arizona freshman Trevia Gumbs, landed the Jr. Female Athlete of the Year for a second time after winning it in 2012. Gumbs established National Records in the Shot Put, (14.83m) Discus Throw (46.69m) and Hammer Throw (47.66m) and was second in the NJCAA Shot Put as a freshman. She also won Carifta Games silver in the Shot Put with the 14.83m effort. 400m Hurdler Kyron McMaster now a freshman at Central Arizona, repeated as Jr. Male Athlete of the Year. In just his second year of hurdling, he broke the 18-year old national standard when he clocked 50.16 seconds at the Pan Am Jr. Championships in Edmonton, Canada. Just 14, Beyonce DeFreitas earned Youth Female Athlete of the Year laurels. She was a Carifta Games 200m finalist and placed fifth with a personal best run of 24.50 seconds. After turning some attention from Basketball to track, Malaki Smith took the Youth Male Athlete of the Year award. He was a silver medalist in the CAC Age Group Championships 60m and a bronze in the Baseball Throw. Dag Samuels who has McMaster among his charges was the Coach of the Year. Reuben Stoby and Rosmond Johnson, were the respective Male and Female Road Runners of the Year. As it marked it's 45th anniversary, the BVI Athletics Association doled out its 2015 Lifetime Awards to Ambrozine Wilson, Rita Francis and Eucilita Tom. The trio were volunteers who fund raised for the association in the early 1970s. Athletes breaking and establishing National Records that stood at season's end received awards presented by Sol for their accomplishments. Eight athletes established 13 marks during the indoor and outdoor season. Sr. Male Athlete of The Year Eldred Henry and Jr. Female Athlete of The Year Trevia Gumbs each set three marks.